milestone - operating continuously for 12,000 days. For nearly 33 years, the venerable spacecraft has been returning data about the giant outer planets, and the characteristics and interaction of solar wind between and beyond the planets. Among its many findings, Voyager 2 discovered Neptune's Great Dark Spot and its 450-meter-per-second (1,000-mph) winds. The two Voyager spacecraft have been the longest continuously operating spacecraft in deep space. 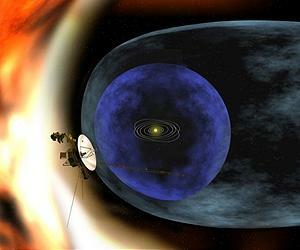 Voyager 2 launched on August 20, 1977, when Jimmy Carter was president. Voyager 1 launched about two weeks later on Sept. 5. The two spacecraft are the most distant human-made objects, out at the edge of the heliosphere - the bubble the sun creates around the solar system. Mission managers expect Voyager 1 to leave our solar system and enter interstellar space in the next five years or so, with Voyager 2 on track to enter interstellar space shortly after that. Having traveled more than 21 billion kilometers (13 billion miles) on its winding path through the planets toward interstellar space, the spacecraft is now nearly 14 billion kilometers (9 billion miles) from the sun. A signal from the ground, traveling at the speed of light, takes about 12.8 hours one-way to reach Voyager 2. Cool fact: My dad, Donald Gray, was chief navigator of Voyager II during its heyday; he was head of the team calculating how to save power by slingshotting it from one planet to another.